Maharashtra govt. is inviting online applications for Mukhyamantri Saur Krushi Pump Yojana 2019 at www.mahadiscom.in/solar. All the interested farmers can make solar pump online registration and fill Atal Saur Krushi Pump Yojana application form to apply online for Mukhyamantri Solar Pump Yojana 2019 in Maharashtra. MahaVitaran (Mahadiscom) is the nodal agency to implement Atal Solar Krushi Pump Yojana for farmers. Under Atal Solar Krushi Pump Yojana Maharashtra, the state govt. has decided to provide 1,00,000 water pumps to farmers. These off grid solar powered agricultural pumps would be deployed in phase wise manner under Mukhyamantri Solar Pump Yojana Maharashtra. This target of distributing solar water pumps to farmers under Maharashtra Atal Saur Krushi Pump Yojana is 1 lakh for the next 3 years starting from January 2019. The state govt. will announce the Mukhyamantri Solar Pump Yojana list of beneficiaries before 31 January 2019 and the installation will start in the 1st week of February 2019. 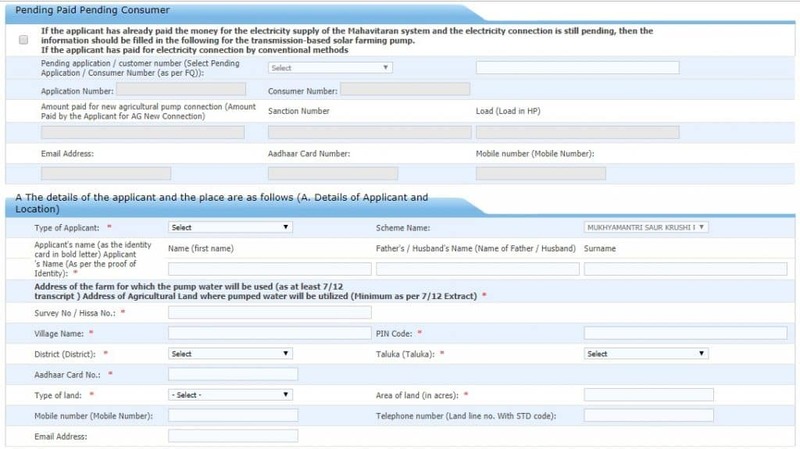 Here farmers can enter details of applicant and location, nearest consumer details, type of source of irrigation, then have to upload documents and click at “Submit Request” button to complete solar pump online registration in Maharashtra. All the applicant farmers of Mukhyamantri Solar Pump Yojana in Maharashtra can even “Track Application Status” to check their application status online. Click at Atal Solar Pump Yojana in Marathi to read the government resolution about the Maharashtra Solar Pump Yojana details. To provide day time power availability for agriculture pumping. Decoupling of irrigation sector from power subsidy burden. Minimizing cross subsidy burden on commercial & industrial electricity consumers. Replacement of diesel pumps in order to reduce pollution. All the farmers with less than 5 acre farmland will get pumps of 3 HP (horse power) and 5 HP for bigger farms. In the 1st phase of Atal Solar Pump Yojana, govt. would distribute 25,000 solar water pumps while 50,000 pumps would be distributed in 2nd phase. In 3rd phase, govt. will distribute 25,000 solar pumps to farmers. As per the eligibility criteria mentioned in the Atal Solar Krushi Pump Yojana, farmers can fill application form to avail new water pump connections. Under this Atal Saur Krishi Pump Scheme 2019, farmers will only have to pay 10% of the total cost of the pumpsets and MSEDCL will install these pumps through authorized contractors. This agricultural pumpsets scheme in Maharashtra is open to all the applicants.